Google Chrome 4.1 for Windows doesn't add too many new features, but it's a very interesting release. Google Chrome is the only browser that automatically translates web pages written in foreign languages. It's a great feature, previously available in Google Toolbar and in a Chrome extension, that's now included in a browser. Besides using the best free machine translation service available today and translating pages inline, Google Chrome uses a language detection algorithm that doesn't require a connection to Google's servers. The language detection library is open source and any developer can use it. "For most languages, the library determines the language of a page by breaking down its text in quadgrams, or sequences of up to four characters. The library then looks up each quadgram in a large hashtable that contains language probabilities, which is included in the Chrome binaries. This hashtable was originally built by processing language probabilities over billions of web pages library are indexed by Google's search engine. In just a few milliseconds, the library can accurately determine the language of most web pages." Chrome's blog mentions that Google Update no longer generates an unique ID for each Chrome installation. "We've implemented a new approach to our Google Update technology, which allows us to remove the unique ID from Google Update while still preserving our ability to determine the number of active users and keep everyone up-to-date with the latest security updates and speed improvements." 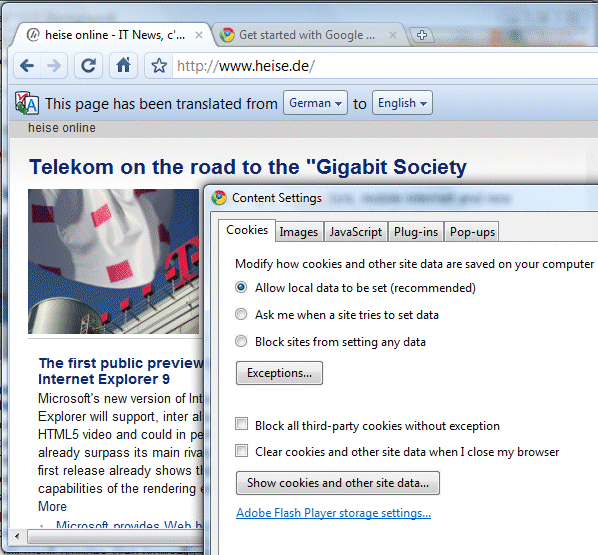 There's also a page that explains the privacy controls that are available in Google Chrome. Chrome is more cluttered (translation infobars and content filtering icons should be more discreet), better suited for advanced users and it's updated faster: 4.1 is an intermediary version released two months after Chrome 4.0. "We've implemented a new approach to our Google Update technology, which allows us to remove the unique ID from Google Update while still preserving our ability to determine the number of active users and keep everyone up-to-date with the latest security updates and speed improvements." So, no more privacy issue ? It's cute but I won't use chrome until it feaures RSS bookmarks bar like Firefox. That's the only thing keeping me at mozilla. Cheers! As the person who implemented the "content blocked" icons, I'm curious: how do you propose to make them more discreet? How Could I turn off the Auto Translate Feature, it is Extremely Annoying, I think this is a big step backward for Chrome. Showing a single icon when some content is blocked has at least two advantages: less visual clutter and the feature can be extend to other kinds of content (iframes, audio/video tags, Flash etc.). Some users might like to see the page action icon all the time, so they can easily block content from the page. A fashionable looking browser. Those who are habituated to menu bar of Internet Explorer and Firefox will get used to the minimum tools available in Chrome, but the redeeming features are attractive enough. Use it and find out the qualities that make Chrome a gem. Recommend it to friends. Google chrome is the best web browsing features of compaire any other browsers i like it and my favourite browsers. I love all things about Chrome but Can you explain one thing, is Chrome 5.0.342.5 have all features of Chrome 4.1.249.1036? and why there is no uploading box when I open rapidshare? * Users have to click the icon to figure out what was actually blocked. This is especially confusing for the 99% of users who won't change the defaults, and thus are only blocking popups -- because it's not obvious that if a popup was blocked, you go click this thing that doesn't look like it's related to popups. That particular problem could be eased by splitting out popups into a separate icon, but the general principle remains. * The bubble you get when clicking the icon can rapidly become unwieldy. It's easy to start having many different sets of radio buttons, links, descriptions, etc. The solution to this would probably be to remove direct controls from the bubble and force users to go through the master exceptions lists -- but this means making things several steps more inconvenient and less clear. * iframes -- we already show icons when content in iframes is blocked. If you are saying that we should have separate controls in the bubble per origin on the page, then collapsing the bubbles into one makes that much worse, not better. * flash -- already covered by the "plugins" case. Again, if you want separate controls per plugin type, collapsing icons makes this worse, not better. A "plugins" icon that showed multiple separate plugin controls would be bad, but not as bad as a single global icon which showed all of those AND everything else. * audio/video tags -- It's not obvious what controls we want to give users here (there are many different possible use cases), so it's hard for me to say whether a unified icon would make things better or worse -- but given the cases above, I suspect worse. In general, almost all users, and even users who turn on cookie or script blocking, will only see one or rarely two icons. This strikes me as a good outcome and I'm not so worried about reducing the icon count for people who turn on all blocks and visit rich pages at the expense of most users who don't. Thanks for the update. I'll keep my CMS extensions updates as well. Make sure you have the latest updates from Windows Update and your drivers are up-to-date. Install the latest drivers for your graphics card, sound card and network adapter. Would be nice if someone here can tell me how to change the download location file on the "New and improved Google Chrome" it seems that they have taken away the option to set up your own download location. Check the "Under the hood" tab from the Settings dialog. Nothing has changed.